It has been such a pleasure to work with you and your dogs and cats in 2017, and we look forward to continuing our relationship for the years to come. We would like to take this opportunity to thank you for choosing us as your pet care provider and entrusting us with your furry family members. 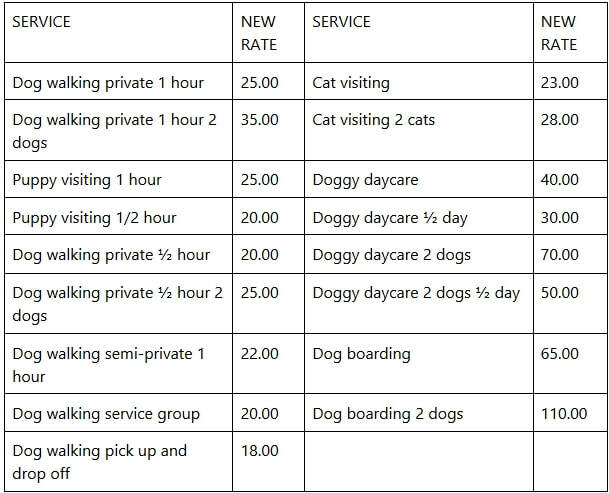 At Coco and Toto we strive to provide the best pet care at the most affordable price. Over the years we have managed to maintain our low rates despite numerous increases in overhead. This coming year, due to the rising minimum wage for NYC beginning 12/31/2017 and after experiencing the same increase at the end of last year, we need to take measures to maintain the stability of our business, adjust the wages for our employees, cover the increase for payroll liabilities, workers’ compensation insurance and other costs for business expenses such as rent increases, new labor regulations, insurances, etc. As a result, we will be slightly increasing our rates starting January 1st 2018. We are dedicated to providing you with excellent pet care service and look forward to working with you this coming year. We appreciate your continuing support in making Coco and Toto the ultimate pet care place! Thank you for your commitment to our services.